I started Grace again using smaller needles. I really like how it's turning out! 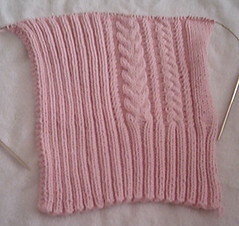 I'm using Lion Brand Cotton-Ease in the Strawberry Cream instead of the Cotton Angora. I'm very happy with the choice! :) I started it on Monday when I went to the Cozzi-Cafe to knit. Yes, I finally made it! It was so much fun too. I met two very nice people and I had a lot in common with one because she also has two boys the same age as mine! So we had a lot to talk about (especially our potty training woes!). Well, not much else going on here... just work and more work! Oh I finished all the regular knitting on my ribby cardi... just have to put it together now and do the collar and zipper (or snaps). Fun, fun! Wow, Grace is looking gorgeous! Love the color. Oh I love grace! I hear about potty training. I just got done on my 3 yo daughter....now I have to start my 2 year old son.....NIT looking forward to it! Thanks for all the nice comments everyone! :) I'm loving this sweater!